Nothing says Fall quite like pumpkin. Pies, breads, and bars - oh my! And, of course, there are the cookies. When I think of a pumpkin cookie, I think of the little soft puffs (my family calls them Pumpkin Bumps) that so many people make around the holidays (me included). 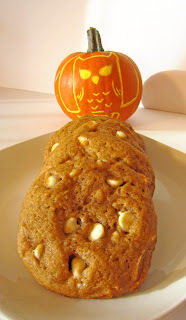 But pumpkin shouldn't be limited to one cookie alone! This recipe is a nice example. It's a bit like a cross between cookie and cake - a little bit soft, a little bit chewy. And tasty - yes, very tasty! This recipe was adapted from one by George Duran on foodnetwork.com. It's quick and easy and yields scrumptious results. A perfect cookie to honor Autumn - and the mighty pumpkin! 1. Line baking sheets with parchment paper. Preheat the oven to 350°. 2. In a medium bowl, whisk together the flour, baking soda, spices, and salt. Set aside. 3. Combine the melted & cooled butter and the sugars in the bowl of a stand mixer. Beat on medium speed until creamy. 4. Beat in the eggs, one at a time, waiting until the first is fully incorporated before adding the second. Scrape down the sides & bottom of the bowl and beat for another 30 seconds. The mixture should be smooth. 5. Add the vanilla and pumpkin to the bowl. Beat until well mixed - the mixture will look curdled. 6. Add the dry ingredients and beat on low until the dry ingredients are just combined. Do not over-mix. 7. Stir in the white chocolate chips. 8. Scoop the dough onto the baking sheets, leaving 2" between each (about 2 tablespoonfuls of dough per cookie). 9. Bake for 11-13 minutes or until the edges are golden brown and the centers are set. The longer you bake these, the more cakey they become. Try not to overcook. 10. Allow the cookies to cook on the baking sheets. Serve!